Previously we mentioned about DocFetcher that can search and retrieve documents quickly, here comes another great free utility that allows a fast documents searching without the need of indexing. Named as UltraSearch, it is a tiny utility that can accomplish similar goal with additional advantage of portability and smaller foot print. 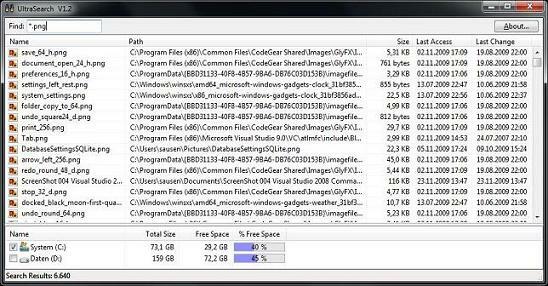 Once download and without the need of installing the utility, unzipping the exe file will launch to a simple GUI. Unlike other utilities that require indexing process first before ready to be used, users can start keying in any keyword to initiate the documents search instantly. Depending of your file database and hard disk capacity, typically it takes seconds only to complete the search with a full list of related documents available for viewing. However, it doesn’t come with preview pane like DocSearch and users will need to right clicking on the shortlisted documents for preview or fully opening depending on its file type. Besides, it doesn’t have advanced search and so you will have to bear with a huge lists of related documents without ability to sort documents by file size or narrow down the search in specific folders like DocSearch. Nevertheless, UltraSearch is quite a simple tool and more importantly, its small foot print with less than 2MB file size and availability in portable version make it especially useful across individual PC systems for fast document searching in Windows XP, 2000,Vista and even Windows 7 (both 32-bit and 64-bit versions).